With over 160,000 errors in US healthcare institutions every year caused by misidentification, it’s clear that labeling samples as soon as they’re taken can help improve patient safety. 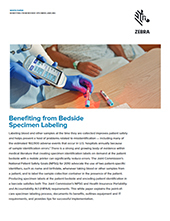 The ability to create specimen labels on demand with mobile printing technology, at a patient’s bedside, could significantly reduce the number of errors made. Barcodes can include more information than written labels – encoding patient identification in a barcode satisfies the Health Insurance Portability and Accountability Act (HIPAA) requirements too.